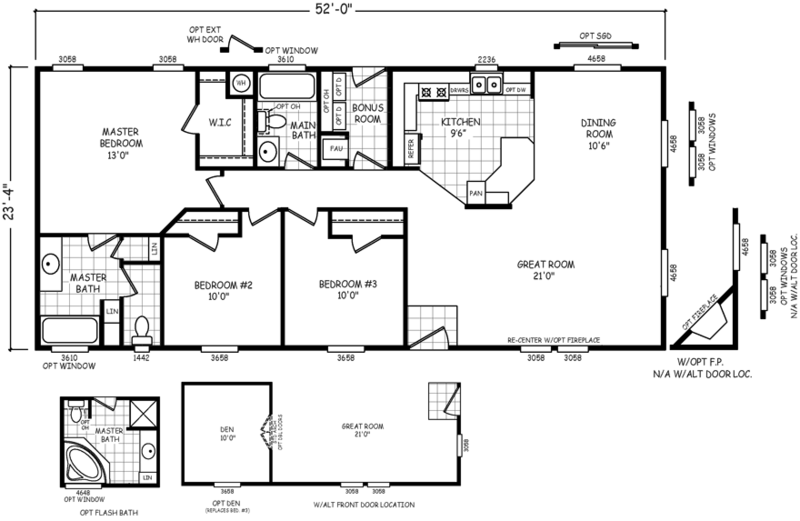 The Aurora model has 3 Beds and 2 Baths. This 1213 square foot Double Wide home is available for delivery in Arizona, California, Nevada, New Mexico, Colorado, Utah. Could this be your dream home? The inviting Aurora features a beautiful yet practical kitchen with angled snack bar and a master suite is filled to the brim with modern conveniences. Note the giant walk-in closet and separate linen closets. Boost the luxury level another notch by opting for a swanky flash bath, a den and a fireplace for your great room! If pictures are shown, they may depict upgrades and options that are not included within the base price of the home. Ask your housing consultant for details about the other great features that come standard on the Aurora manufactured home.